Inciting A Riot: Blessed Samhain/Happy Halloween/Enjoyable Saturday! Have a happy Samhain and a safe Halloween. Downside: I'm sick as all get out and no doctor will see me until Monday. Upside: I'll be home for the trick-or-treaters! Downside (again): I can't actually give out any candy as I am an incubus of viral plague. Upside (again): I might convince my partner to go buy a big pumpkin and let me carve it into a Jack-O-Lantern! That would take my mind off of my aforementioned incubus-of-viral-plague-ness. 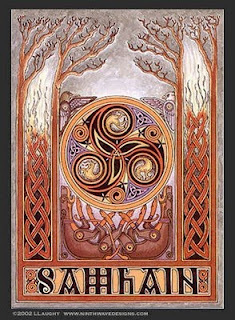 Samhain ritual for your BOS below. Great Lord and Lady, blessed spirits who have passed, we welcome you this night. Join our feast; take part and be guided on your journey. We call on our ancestors, family, friends, elders, and cherished loved ones who have passed to guide us in the coming year. We thank the Gods for the blessings given to us as we say farewell to the Old Year and welcome in the New. Praise the Crone Goddess, sorrowful in Her mourning. Praise the Aged God, Beloved of the Summerland.